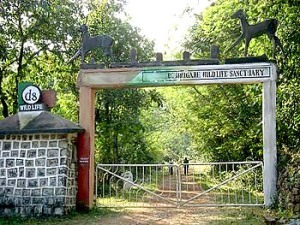 Debrigarh Wildlife Sanctuary in Odisha, India is located about 40 kms from Sambalpur in Odisha's.he sanctuary entrance point at Dhodrokusum neighboring Hirakud reservoir is 40 km. from Sambalpur and 60 km. from Baragarh. To reach this place, the nearest railhead lies at Sambalpur while the closest airport is at Raipur. The best time to visit Debrigarh Wildlife Sanctuary of Odisha is between November and June. Spread over 347 sq kms of dry deciduous mixed forests, Debrigarh Wildlife Sanctuary forms part of the famous Hirakud Dam that attracts numerous migratory birds during winter. Prominent species of fauna that you will get to see here are the leopard, hyena, bison, Royal Bengal tiger, sambar deer, chousingha, spotted deer, chameleon, crested serpent eagle and monitor lizard. Besides the migratory birds, this sanctuary also plays host to many resident birds.The sanctuary has luxury Eco-cottage accommodation.